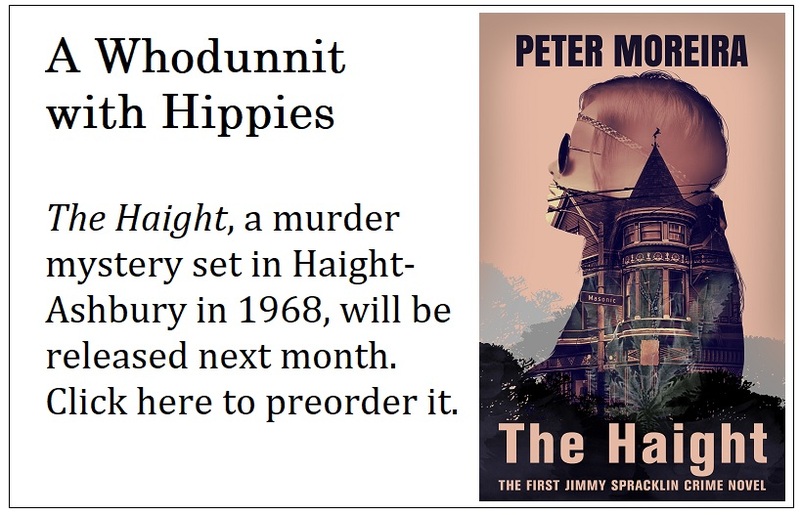 It seems fitting that I’m announcing now that The Haight, my new mystery novel set in San Francisco’s Haight-Ashbury district in 1968, will be published in three weeks. After all, it was 50 years ago this week that Lieutenant Jimmy Spracklin and Sergeant Ed Burwell drove up to North Beach to solve the murder of the artist John Blakely. The book’s climax takes place just before dawn on June 5, 1968. I think it’s great that The Haight will be published July 24 – about 50 years and six weeks after Spracklin concluded his agonizing investigation into Blakely’s death. When I began writing this novel, I knew the setting was of the utmost importance. I knew I wanted to base a murder mystery in Haight-Ashbury, the home of the Summer of Love, the Grateful Dead and the hippie ethos I’ve always loved. Rather than set the story in 1967, when Haight-Ashbury was at its peak, I chose the angst-ridden summer of 1968. The time was as essential as the place. In early June 1968, America was a cauldron of tension. Martin Luther King Jr. had been dead six weeks. The Tet Offensive months earlier had proven the country’s vulnerability in Vietnam. Lyndon Johnson had announced he would not seek re-election. The only beacon of hope seemed to be Robert Kennedy, who was seeking the Democratic nomination and needed to win the California primary on June 5. Haight-Ashbury was impacted by this upheaval. Months earlier, it had seemed an LSD-laden haven of peace and joy, but that had all changed. Heroin was becoming the drug of choice by the summer of 1968, and the area was growing dangerous. That’s the setting in which I chose to kill John Blakely, a young artist living in a shabby Victorian House on Masonic Avenue, just off Haight Street. His friends all thought he’d over-dosed, but the autopsy showed his heroin had been cut with silver cyanide. He’d been poisoned. When Spracklin learned of the murder, he took the case himself. As the head of the SFPD’s Bureau of Inspectors, Spracklin could have handed it off. But he was drawn to Haight-Ashbury. A year earlier, his 16-year-old step-daughter Marie had run away to the Haight. He’d searched for her every spare moment and investigating the Blakely murder would allow him to devote more time to the search for his missing child. The Haight is the story of the investigation into Blakely’s death, and Spracklin’s search for his beloved Marie. The response to the book so far has been great. I’m thrilled with the pre-sales my publisher Roger Williams has generated in the San Francisco area. Interested? Want to know more? Then follow my author’s page on Facebook by clicking here. I’m going to be blogging through the summer. If you’re interested in the era, the story, classic rock and crime fiction, you’ll find something to interest you. Better still, you can order the book on Amazon here. You’ll probably receive the book by the end of of July – just in time to take it to the beach. Editor's note: This post originally said the book would be published July 3. Unfortunately, the dates have changed and it's now due out July 24.